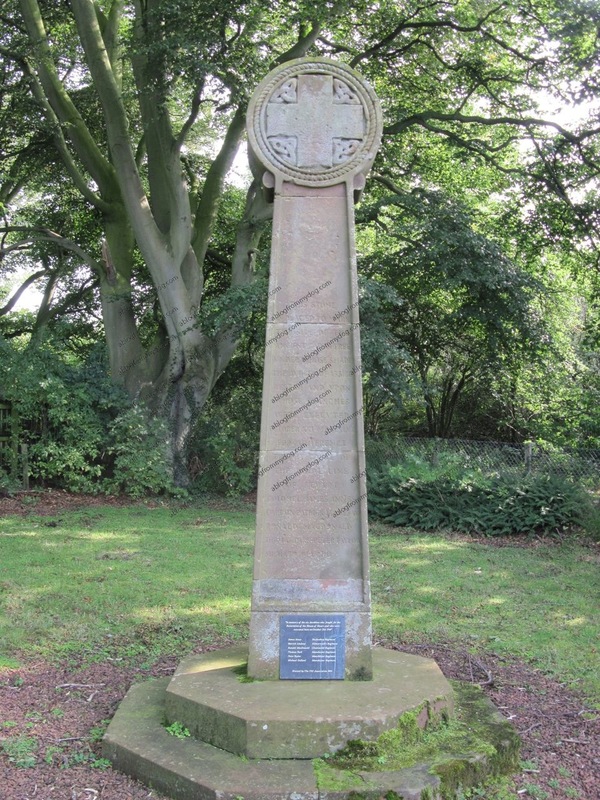 The Capon Tree Monument in Brampton was erected to the memory of six Jacobite soldiers who were hanged, drawn and quartered there in 1746. The history of this well weathered monument dates back to 1904 when it was erected by public subscription, though it is not clear why it was erected in 1904. The condemned men were incarcerated along with other Jacobite soldiers in the bleak dungeons of Carlisle Castle after it was re-taken from Jacobite hands in December 1745 by the Duke of Cumberland. They were dragged through the streets of Brampton on a hurdle, a wooden frame, to the Capon tree, where they were hanged, drawn and quartered on 21 October 1746. Their fellow soldiers were likewise executed at Gallows Hill in Carlisle. During the 1745 Jacobite Uprising, Bonnie Prince Charlie made Brampton his headquarters. This stone is placed to mark the site of the ancient capon tree under whose shade the judges of assize rested and upon whose branches were executed October XXIMDCCXLVI for adherence to the cause of the Royal line of Stewart. On the reverse is the following carved text : Erected by subscription 1904. Hugh Jackson, Chairman Brampton Parish Council Henry Penfold Hon Sec and Treas. A new metal or slate plaque has been screwed to the base of the monument installed by the 1745 Association in 2004. On 22nd October 2013 an oak tree was planted by local school children on the site where the original Capon Tree stood to commemorate the memory of the men that were hanged and celebrate peace between Scotland and England. The original tree died around one hundred years ago.